Liber, ne pariš konstantno na 15 W - tu je prva razlika. Posmatraj ovde snagu na grejaču kao brzinu kojom postižeš željenu temperaturu. Ništa više od toga. Fusion ja to sve znam što pišeš , dakle prvi udar na podešenih 40W na hladan coil od 0,2 ohma je ~15A sa tandencijom opadanja na oko ~6A pre nego isključi jer je postigao zadatu temperaturu , jel tako ? Dakle sve to traje koliko , sekundu ? Kažeš kompenzacija ok da vidimo ..
Uzmimo srednju vrednost potrošene struje u toj sekundi a to je oko 10A , slažeš se ? Sadašnja prosečna potrošnja mi je oko 2A i cug u proseku 3 sekunde , da li je to identično 6A u sekundi ? 10>6 slažeš li se ? Wati su tu da bih sto brze postigao zeljenu temperaturu, moze da se pari i na 7w, ali postizanje zeljene temp ide znatno sporije. Inace cip regulise temp time sto wataza varira, kad krenes da paris imas bust da bih se brze zagrejao grejac,pa onda zakuca na zeljenu watazu sve dok polako ne dolazi do zeljene temp, kako se priblizava zeljenoj temp, wataza opada i time odzava temp. Tako da retko kada paris na 15w, to je veoma tesko definisati, u slucaju kontrole temp, paris na odredjenoj temperaturi. Zanima me, od proizvoda koji se nalaze kod nas na tržištu, da li postoje grejači koji mogu da dostignu temperaturu od oko 140 stepeni Celzijusovih? I ukolik ne postoje, koja je to kombinacija baterije i klira koja može da dostigne najviušu temperaturu? Skoro svi, ako ne i svi modeli dostizu tu temperaturu. Modovi koji imaju mogucnost podesavanja temperature, cini mi se svi imaju donju granicu od 180 stepeni i gornju 280. Da li znate koja maksimalna temperatura se moze postici na suvom grejacu ? Pa da vidimo ..
Ukoliko koristim NiCr debljine 0,25mm i na grejacu mi dolazi nesto vise od 2A dakle ...oko 650C ..
"Temperatures generated on the “dry” coil, while applying 5 different wattages of 5 W, 10 W, 15 W, 20 W and 25 W, were 380 °C, 490 °C, 625 °C, 800 °C and 950 °C respectively"
"In this experimental setup the temperature generated on the heating coil was recorded over 5 consecutive puffs with the cotton wick imbued with the commercial e-liquids. 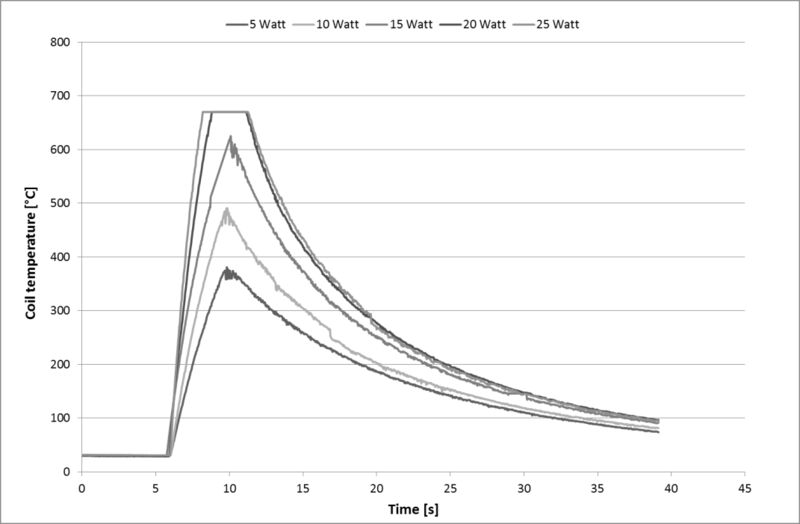 The results show how, during the first three puffs the temperature measured on the coil surface does not significantly differ for 10 W, 15 W and 20 W, whereas the temperature measured at 5 W is distinctly lower. A possible explanation for this is that once the boiling temperature of the glycol/water mixture is reached (132 °C for Glycerol/water 88:12, 123 °C for Propylene glycol/water 85:15), the energy supplied by the battery is primarily consumed for the evaporation of the glycol and less for further heating up of the coil. 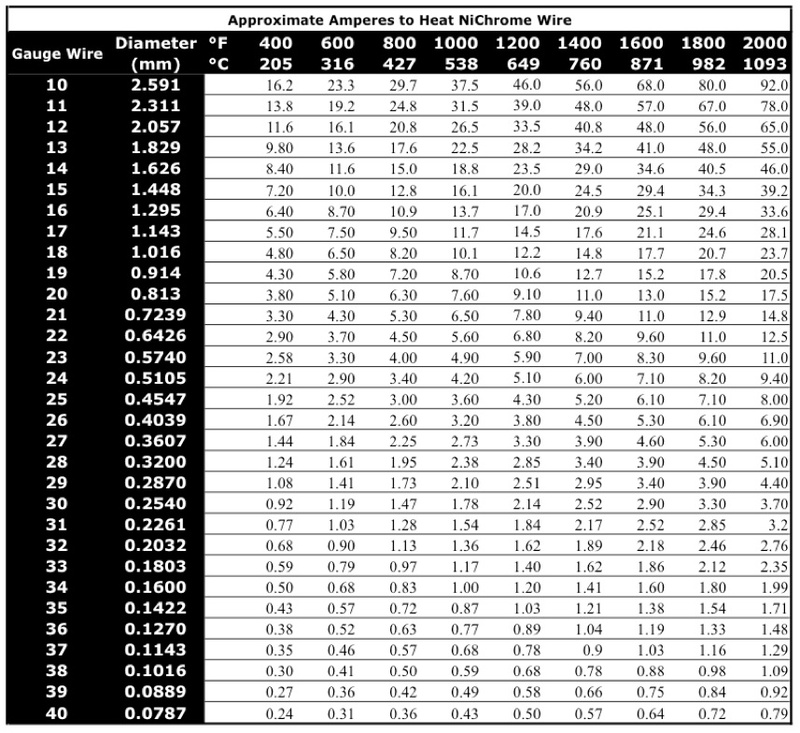 The differences between temperatures measured in this set of tests and those measured on the “dry” heating coil appear to agree with this hypothesis. Values plotted on the y-axis in do not correspond to the boiling temperatures of the glycols, as the thermo-camera recorded the temperature on the outer surface of the coil, and not the temperature of the liquid. Temperatures recorded during the fourth and fifth puff at 20 W are however significantly higher compared to those measured at 15 W. Effects occurring close to the heating coil, such as local liquid dry-out and local overheating, might be possible explanations for this. Setting the battery output at 25 W resulted in ignition of the vapours. Data were therefore not collected. Ignition of the vapours in the fully assembled e-cigarette is however unlikely, as the availability of air is much lower. A second trend can be observed due to the general heating up of the entire device, and consequently the increasing baseline temperature before each puff, peak temperatures on the coil during the puff increase as well with each consecutive puff. This resulted in differences of approximately 50 °C at 5 W and 100 °C at 20 W between the first and the last puff. This effect might potentially have an impact on the formation of carbonyls, keeping also in mind that it might be more pronounced in the assembled device where heat-dissipation is considerably lower. 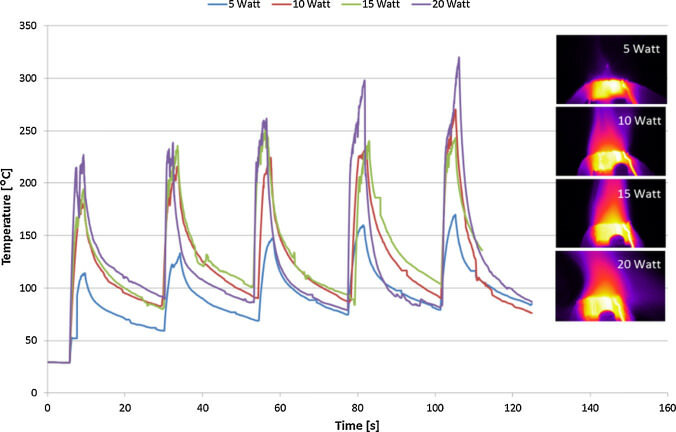 In conclusion, these results show the correlation between the relatively lower emissions of carbonyls at 5 W with coil temperatures below the boiling point of the glycol/water mixtures on the one hand, and, on the other hand, higher carbonyl emissions at higher coil temperatures which enhance glycol decomposition." Stranica je napravljena za 0.099 sekundi sa 36 upita.